We have an empty warehouse 7,000 sqft. 35' hight possible. 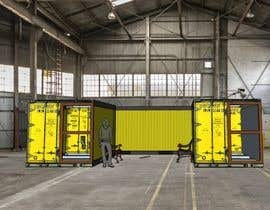 We are looking for modern, green, sustainable and interesting designs... We are looking to have designs made based off 20 foot and 40 foot shipping containers converted into green clean - 8 foot wide x 9.5 feet tall and 20 feet long. We would love to see a version of 3 or 4 little ones 20' units (160 sqft) And if possible some two story mixture designs. We would love for some of your style to come through. What makes a fun, cool co-work space for you? Feel free to also show sketches of previous work. oh. sorry. I will be hiring 3 designers. pleaser feel free to send. also send me your portfolio. If I could just get a rough sketch wire frame of THREE 20 foot container offices inside this warehouse, with your style finishing. And samples of your work for reference. I am attaching some reference photos of the actual warehouse...If selected we will pay $300 + to commission a set of expanded designs. I will try and get the amount upped. Sorry guys. Let me see what I can do. I am happy to take very rough sketches, nothing finished if you wish.